As the leaves fall from the vines in November, the annual race against the clock begins in the cooler reaches of the Northern Hemisphere. 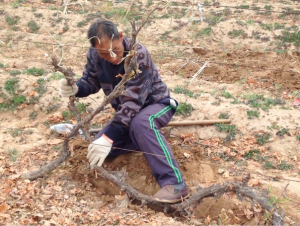 In Ningxia, China, vineyard workers at Pernod Ricard’s Helan Mountain Winery begin the arduous process of laying down canes for winter burial. Wind machines are readied for their winter vigil at Southbrook Vineyards on the Niagara Peninsula of Ontario. Meanwhile, at Domaine St. Jacques in Québec, a tractor appears in the vine row equipped with twin, overhead rolls of white fabric. “Cold hardiness is the main limiting factor for growing grapes in many regions across North America, and beyond”, affirms Dr. Jim Willwerth, Senior Viticultural Scientist at Brock University’s Cool Climate Oenology and Viticulture Institute (CCOVI). And yet, despite the challenges posed by icy winters, new vineyards continue to emerge in some of the chilliest corners of the planet. The ever-increasing frequency of extreme heat and drought in many traditional vineyard regions is driving wine grape growers to seek out cooler climates. Thanks, in part, to this pattern of global warming, areas once considered too cold to successfully grow Vitis vinifera grapevines are flourishing. The Niagara Peninsula is just one such example. Thomas Bachelder, winemaker in Oregon, Burgundy, coastal Chile, and Niagara, is convinced of the region’s vast potential. “We have the degree days, and complex limestone-rich soils”, explains Bachelder. 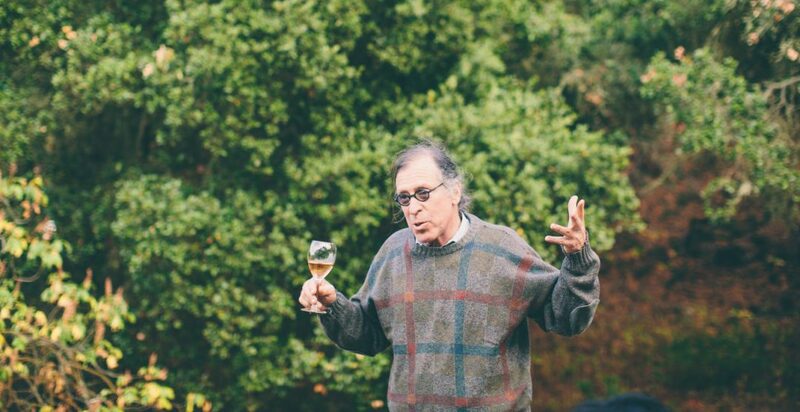 “Niagara Chardonnay is elegant; racy, mineral and floral, with a solid core of rich dry extract”, he adds. However, while temperatures may be milder on average in many marginal regions, climate change is also bringing more erratic weather patterns and greater extremes. In northerly, continental areas this means more vicious cold spells. The Vitis vinifera grape vine is not winter hardy. According to Dr. Willwerth, temperatures below -15°c can lead to loss of fruiting buds and damage to stem tissues. Winter injuries to grapevines create opportunities for infection and can lead to the development of Crown Gall disease. When the thermostat lingers below -25°c it can kill vines outright. Because of this, cold hardy hybrid varieties are the preferred cultivars in many wintry regions. Lerkekåsa Vineyard in Norway focuses mainly on ungrafted hybrids like Hasanski sladki and Solaris. In Northern China, breeding programs have long centred on the Vitis amurensis grape species that can withstand temperatures of -40°c. In Québec and the Midwestern United States, resistant varieties such as Marquette and Frontenac are common. …while temperatures may be milder on average in many marginal regions, climate change is also bringing more erratic weather patterns and greater extremes. Critical success on an international level remains elusive for hybrid grape wines however. Consumers and professionals alike still maintain that Vitis vinifera is the only grapevine species qualitative enough for fine wine production. Regardless of limiting factors, the majority of growers continue to prize vinifera plantings above all others. And while they accept that some loss of fruiting buds is the price to pay for growing Vinifera in cold climates, they are increasingly looking for more effective solutions to keep these casualties to a minimum and prolong the lifespan of their vines. The most important defense against winter injury lies in the initial grape variety and site pairing as different cultivars have varying degrees of cold hardiness. Vines must also be adequately prepared for the dormant period. Over cropping is found to reduce winter hardiness. “Managing vigour and crop level is key to ensure that we harvest at optimal maturity, at a reasonable time in the fall”, explains Southbrook’s Winemaking Consultant Ann Sperling. The vine requires time to build up sufficient reserves in its trunk and canes to resist cold temperatures. Yet even vines in good health, with adequate stores, require additional protection to withstand deep freezes. These measures vary from one region to another, depending on the severity of winter temperatures, vineyard size, budget, available labour, and so forth. The most important defense against winter injury lies in the initial grape variety and site pairing. Yet even vines in good health, with adequate stores, require additional protection to withstand deep freezes. In regions where temperatures sub -15°c are a rare occurrence, wind machines are common. CCOVI estimates that half of Ontario’s vineyards are equipped with wind machines. These large fans can bring a 2 to 3-degree temperature increase around the fruiting zone. They have a number of shortcomings however. “At wind speeds of 8km/hr or higher wind machines are useless. The inversion layer doesn’t form”, says Sperling. “Their mechanisms are also easily damaged by wind”, she adds. The cost is prohibitive for many small growers. Tom Higgins of Heart & Hands Wine Company in the Finger Lakes region of New York estimates the price per fan at 50 000$ USD, with each unit covering 4 to 6 hectares. To help growers use fans (and other cold protection methods) more effectively, scientists at CCOVI have created a bud cold hardiness monitoring program called Vine Alert. The system tracks a multitude of different cultivars, from vineyard plots all across Ontario, throughout the dormant period, sending alerts to growers when dangerous cold spells are forecasted. Similar such programs exist in British Columbia’s Okanagan and Similkameen valleys. Where winter lows regularly plunge to -25°c or less, more dramatic actions are necessary. The most popular technique world-wide is to bury vines deep under the soil. 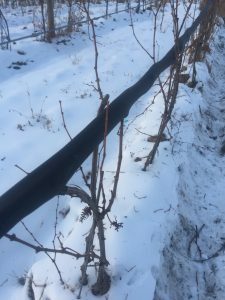 While this method effectively protects vines against freezing temperatures it carries many risks. The process of laying down and uncovering the vines damages the vines and increases the potential for diseases entering cracks or trunk wounds. According to Helan Mountain Operations Manager, Mike Insley it is also “incredibly labour intensive and expensive”. Insley estimates that one third of the winery’s labour budget is spent covering and uncovering the vines. 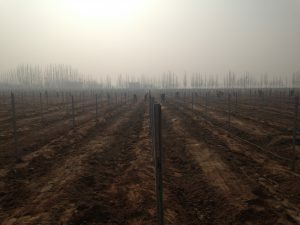 Burying vines is an effective technique against freezing temperatures yet it carries many risks. The decision of when to unearth the vines is also fraught. Exposing the vine to the elements in early spring means earlier bud break and a longer growing season yet leaves the vine defenceless against spring frost. At Hinterland Winery in Prince Edward County, Ontario the team waits until late May, after the risk of frost has passed. This brings its own set of challenges. “We lose a month of the growing season”, says owner Vicki Samaras. “There is a risk of bud rot if the soils are moist”, she goes on to explain, “and, worst of all, you can hear the buds popping off as you pull the canes from the soil”. From China to Russia and through out Canada, vine burial practioners are vocal in their frustration, yet committed to continue. “Why do we persist in the face of all of these disadvantages?” asks Insley, “Simple, we can’t grow vinifera varieties without winter protection”. Insley believes that the growing season conditions and subsequent high quality of wines produced in Ningxia is worth the effort. In certain areas, alternate solutions are slowly gaining traction. Yvan Quirion, proprietor of Domaine St. Jacques, began experimenting with geotextiles on his estate in 2006. The results were so compelling that he now covers his entire 23-hectare property. Quirion trains his vines 30cm from the ground to capture ambient heat from the earth. He does an initial Cordon de Royat pruning, and then uses a tractor to drape geotextiles over the trellis in a tent-like fashion, securing the base of the fabric to the ground. Quirion says he can cover 20 kilometres in a day; winterizing the entire estate in less than a week. With careful maintenance, he has managed to re-use many of his geotextiles for going on 10 years. Domaine St. Jacques began experimenting with geotextiles in 2006. The results were so compelling that they now covers their entire 23-hectare property. Despite many bitter winters, Quirion claims he has only incurred notable bud damage once, in January 2018, when the longest cold streak ever recorded struck the region. Even then, Quirion estimates a mere 10 – 15% loss of fruiting buds. Adamo Estate Winery in Hockley Valley, Ontario was also struck with similar temperatures, and the vines under geotextiles faired well. Only the Merlot grapes suffered bud damage. Trials at Hinterland Winery began in 2018. 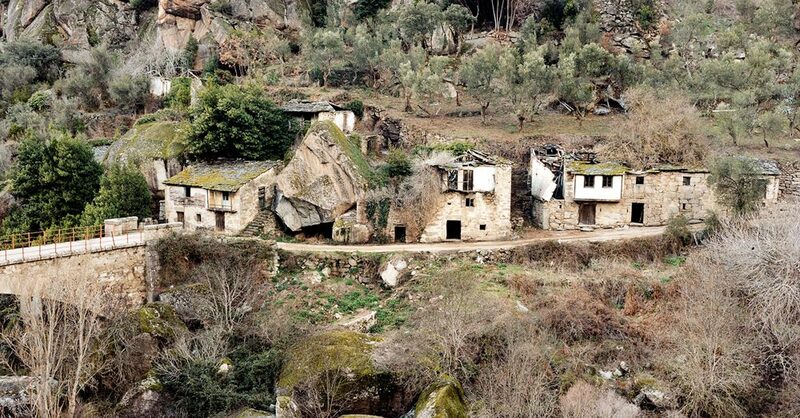 “We saw a 33% increase in yield this year”, enthuses Samaras. Vines were uncovered a full month earlier than usual allowing for earlier, more uniform bud break. 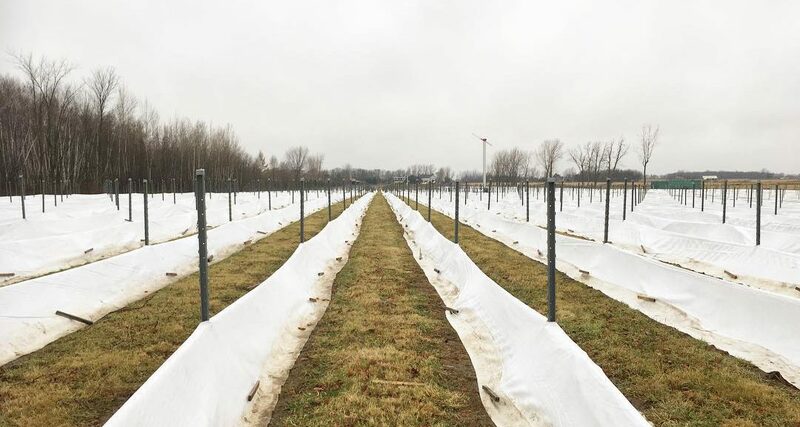 By bundling the geotextiles up on the topmost wire above the fruiting zone, they were able to keep them at the ready in the event of spring frost. Adamo Estate began testing geotextiles in 2015, in partnership with CCOVI. After three years, winemaker Shauna White deems the results “phenomenal”. “The buried canes were much darker and less vibrant”, she asserts. “Under the blankets, they are brighter and healthier looking.” White also enthused about the increased crop load. In 2017, a geotextile-covered Pinot Noir plot half the size of a neighbouring, buried vine plot gave the same quantity of wine. Adamo Estate began testing geotextiles in 2015, in partnership with CCOVI. After three years, winemaker Shauna White deems the results “phenomenal”. The use of geotextiles has even allowed Hinterland Winery to farm organically for the first time. “There is a lot of fungal disease in Ontario, much of which originates from the soil”, explains Samaras. “When you bury vines, you are obliged to train the vines low to the ground. Using geotextiles, we have raised the fruiting zone by 15cm”. Geotextiles are not a perfect solution for all estates however. According to Mike Insley, they aren’t a viable option for Helan Mountain Winery. “Covers are potentially problematic on large-scale vineyards – a vineyard with a 3m row spacing would require 3333m of row covering for each hectare. That’s a lot to purchase, store, and apply”. Concerns about cost, storage, and unease with application methods seem to be the major obstacles to greater adoption by growers. At Heart & Hands Wine Company, Tom Higgins is taking another approach. He has devised an automated heating system to protect against icy temperatures. Heating tape, more commonly used in roof de-icing, is permanently attached to the fruiting wire and then wrapped in plumbing tube insulation over winter. Temperature probes inside the insulation are triggered to activate the heating tape at -17°c, and to turn it off at approximately -13°c. The system can also be used to ward off spring frost, using higher temperature settings. “For every 100 feet of grape vine, it takes me 20 minutes to apply the insulation, and 10 minutes to remove it”, claims Higgins. 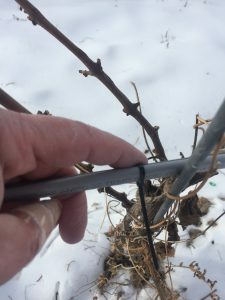 At Heart & Hands Wine Company, heating tape is permanently attached to the fruiting wire and then wrapped in plumbing tube insulation over winter. The ease of use and relative affordability of his plan is a major part of its appeal. Higgins received a Sustainable Agriculture Research & Education grant from the United States Department of Agriculture to pursue his research. Initial results are inconclusive after a relatively mild first winter of use, but Higgins is confident that the long-term benefits will be tremendous. Times and techniques are definitely changing. Cool climate vineyards are gaining in prominence around the globe. Rising temperatures have rendered many wintry regions more hospitable for vinifera grape varieties. However, the increase in extreme weather events in these areas is making effective freeze protection strategies more and more vital. While wind machines and vine burial have proven effective in certain conditions, both methods have significant drawbacks. The advent of recent techniques such as geotextile coverage and heating systems are exciting developments likely to have a major impact on the future of cool climate viticulture.